Illinois Wrongful Death Pain and Suffering Damages | Hupy and Abraham, S.C.
Can damages for pain and suffering be recovered in an Illinois wrongful death case? The damages that you and your family have incurred since the death of your loved one are staggering. Yet, even with the medical expenses, funeral costs, and lost income, there are certain damages that are more significant than the rest. Your loved one may have suffered physical and emotional pain between the time of the accident and the time of death. Additionally, you and your family are suffering emotionally since the loss of your loved one. The Illinois Survival Act allows the decedent’s estate to recover damages that the decedent incurred prior to death. This includes, but is not limited to, damages for physical pain and emotional suffering. 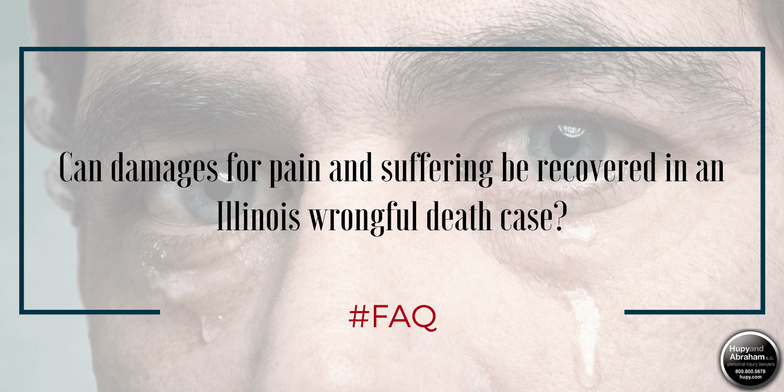 The Illinois Wrongful Death Act allows the surviving spouse and next of kin to recover fair and just compensation, which includes damages for grief, sorrow and mental suffering. As with all damages in a wrongful death case, you will need to prove the value of pain and suffering before you can recover compensation for these damages. This will require both evidence and persuasive arguments in order to get the insurance company to agree to a fair settlement or the court to issue a fair ruling. Since physical pain and emotional suffering are subjective, you may require expert testimony and a skilled attorney to help you get the recovery that you deserve. A doctor, for example, could testify as to the amount of physical pain your loved one likely endured after the accident, and your attorney can use the discovery process to gather evidence about emotional suffering. For more information about what you may be able to recover and how to protect that recovery, please start a live chat with us now or call us any time—24/7/365—to set up a FREE confidential initial consultation with an experienced and empathetic attorney who wants to help your family get the fair recovery that you deserve.